ExerSwim Portable Current Generator | OhGizmo! We all know that people who swim on a regular basis are usually unfit and dangerously overweight. Sadly the goverment won’t do anything about it and I doubt Mr. Spurlock will answer my emails and produce a ‘Super Swim Me’ documentary anytime soon. But, there is hope. It seems one company has actually found a way to use a swimming pool to improve your fitness and burn calories! Now I know you’re probably ready to move on to the next story thinking this is just another company selling snake oil but bear with me a moment. The ExerSwim is a portable device that when placed on the edge of a pool will generate a constant current in the water. This current then allows anyone in the pool to swim for as long as they want getting both a great workout and burning calories at the same time. I think we can all agree that trying to swim in a normal pool without an ExerSwim is an act of futility. After about 40 feet or so you hit the edge of the pool and there’s no where else to go. But with the ExerSwim running it’s like having a 40 foot pool that you can actually swim back and forth in. It almost makes you wonder why these aren’t installed standard with every pool. And I think what makes this device a must have for any pool is the price. The ExerSwim ProTrainer 36 model pictured above is available for a quite reasonable $3,995 on the company’s website. It might seem expensive to some people but when you see those pounds just melt away you’ll know it was worth it. This thing is the worst! I was looking into getting it but it is basically a trolling motor for a fishing boat on top of that it runs on a marine boat battery!! I ended up going with the Fastlane by Endless Pools – the current is night and day between the two. 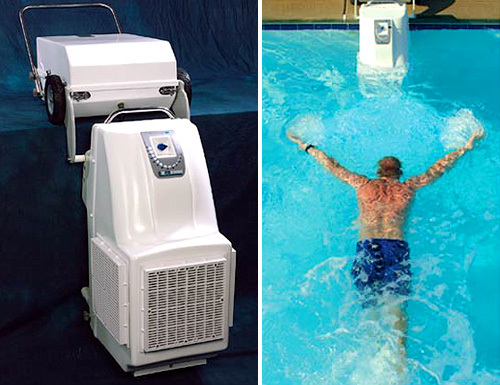 This portable current generator can increase your stamina while swimming.